The summer in Florida is relentless. It's part of the reason that I love it here so much. You can step outside in the middle of the night and become covered in sweat by just standing still. The air is thick. The sun is constant. The rain storms are daily and beautiful. The river here in Jacksonville provides a nice buffer for the heat when the days of sitting in the swelter are just too much. Like a forgiving friend, the St. Johns river whips up an evening breeze like no other. And when you can dine with friends outside by that river and in that breeze, eating local fish and drinking cold wine, well, this summer is welcome to last as long as it likes. The plan was to dine on the dock. But that breeze that I spoke of, became wind. So we stayed close to the house and we compromised. Being in the store and watching the fishmonger prepare the fish took me back to old times. I realised that seeing a fish being prepared like this was a treat and an almost forgotten part of the entire fish eating process. It's so easy to purchase an already frozen piece of filleted fish from the store for dinner. But seeing the whole preparation process in front of me and enjoying the waiting and watching in line made me really appreciate that fish and that little fish store. I went back to the store, this time to get myself some snapper as well. However, I decided to keep it whole. I wanted to bake it as it was. The fishmonger was a lovely gent. He happily scaled it for me, put it on ice and told me that it was a Vermilion Snapper, caught local only 30 miles off shore. That made me very happy. It also made my tummy grumble and my mind begin to work overtime - a summer feast was being plotted. Did I mention how excited I was about the locality of the snapper from the fish shop? Well, it is also peach time in the South. Recipes for peach pies and cobblers are everywhere. It makes sense. They are in season, delicious and local. The ones that I picked up from the farmers market came from Georgia - which for me, is just over the border. And nothing is better than knowing that a good part of dinner came from just a short distance away. Sustainable, fresh, local food. 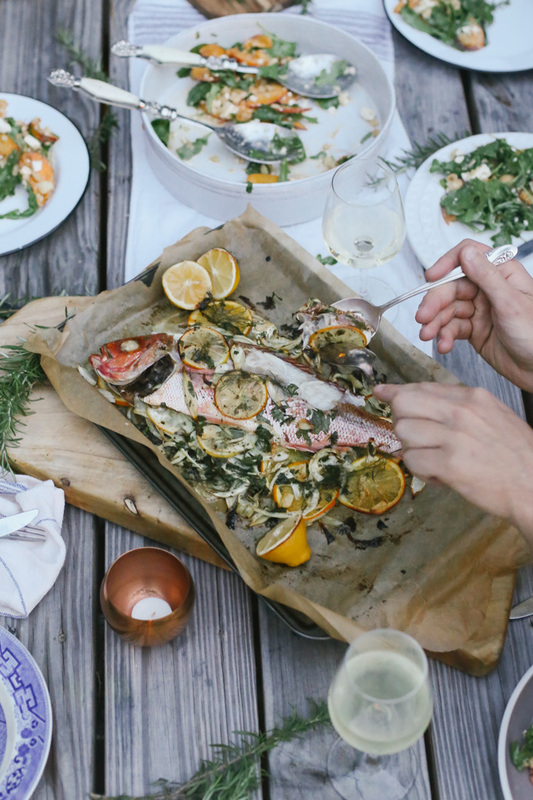 Another reason to be excited about the planning of this scrumptious summer, riverside supper. We also needed a dessert. I have fond memories of my time in the UK learning about Eton College, visiting it's grounds and eating it's well known dessert - traditionally served at the Colleges annual Cricket game against their nearby rival school, Harrow's College. Most commonly, it is broken meringue served with fresh strawberries and cream. It is the ultimate English summer time treat. Although there are some varieties of strawberries still to be found around this time of the year, the fruit that has really overtaken the market stands at the moment are cherries. I found both Dark Hudson and Rainier types, so I decided to substitute their mix for the strawberries, adding pistachios and drizzled caramel toffee for added crunch. The flavour combo, although saying this myself, was really, really good. As it turns out, I am taking quite a longtime sought after trip up north this week. A friend and I are headed to Brooklyn, NY to get our exploring on for a full 14 days. It's adventure time in the big apple. I. Can't. Wait. So, I guess an up side is that although I said I didn't mind it, I am looking forward to taking a break from this humidity. I am also looking forward to time to scout out some belly pleasing eateries, some craftsman stores, roof top cinemas, days watching friends surf at New York beaches, digging around through boroughs, downtown, uptown, east-side and any-which sides and general Brooklyn & NYC frolicsomeness. I promise you many instagram posts. In fact I am genuinely worried about the immediate future of my feed. It is going to become overridden. The downside however, is that for the next two weeks, this is the only food post that will frequent the pages of my journal. So, I've made it a good one for you. I've brought you 4 new summer recipes to keep you happy and cooking until I return from the Hudson back to the St. Johns. Here are the recipes. Happy Summer. Preheat oven to 220°C /425°F. Remove fronds from fennel. Finely slice the whole fennel. Slice oranges and half the lemon. Combine fennel, garlic, oranges, parsley, 4 tbs oil, salt and pepper in a large bowl and toss to coat. 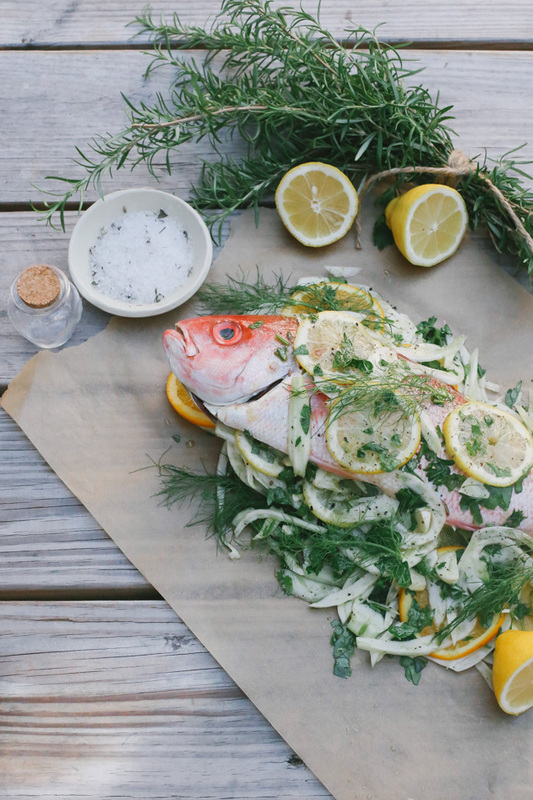 On a baking tray lined with baking paper, spread 2/3 of the fennel and orange mixture along with the fennel fronds over the middle of the tray, big enough to lay the fish over. Stuff the fish cavity with as much of the fennel orange mixture that will fit. Lay the fish on the baking tray and sprinkle the rest of the fennel mixture and the lemon slices over the top. Give the fish a final drizzle with remainder of the oil and extra salt and pepper to taste. Place the other half of the lemon (should still be whole) on the tray as well. Bake in oven for 30 minutes or until the flesh of the fish easily comes away from the bone. Serve as is in the middle of the table with a good squeeze of the baked lemon half. To slice the peaches, cut into the seed around the entire peach. Twist the two halves so that one half comes away from the seed. Using a blunt knife, remove the seed from the other half. Slice peaches length ways into medium/fine slices. In a large salad bowl, combine spinach, rocket/arugula, macadamia nuts, peaches and feta in a bowl. If you don't intend to serve the salad right away, keep peaches covered in a bowl of cold water to prevent them from browning, and toss in with dressing when ready to serve. For the dressing, place oil, vinegar, maple syrup and a pinch of salt into a small well sealed container. Shake to combine. You can also whisk if you don't have a container. Pour over salad when ready to serve and toss to combine. Preheat oven to 220 °C / 425°F. Line a baking tray with baking paper. Place tomatoes on paper keeping vines attached. Fold the paper to make a little 'boat' around the tomatoes - twisting the ends up at both ends. Pour over oil, balsamic vinegar and sprinkle with salt and pepper. Bake in oven for 20-25 minutes. Tomatoes should be partially split and oil/vinegar should begin to caramelize. Preheat oven to 150 °C / 300 °F. Line a large baking tray with baking paper. To make the meringue - In a large, clean bowl whisk egg whites on medium speed until semi firm peaks form on top. Gradually add 200g of sugar. Mix on high speed for 6-8 minutes or until the egg whites are glossy and all of the sugar granules have dissolved. Pour over baking tray so that it is approx 5cm / 2 inches high. Bake in oven for 1 hour. The meringue should be a light brown colour all over and be cooked but still soft in the center. Remove the meringue to cool. Don't worry if it cracks, we are going to crack it anyway - we are making eton mess! Whip the cream until stiff peaks are about to form. Remove the seeds from the cherries by slicing around the seed, twisting to remove one side then remove seed on other side with fingers. Hello purple hands! In a small saucepan, combine remaining caster sugar (100g) with 100ml water. Heat over high heat until boiling, then continue to reduce until the mixture turns a caramel/toffee colour. While your caramel is reducing - On a serving platter, crumble the meringue and roughly arrange in pieces to form a round base. Generously coat the meringue with cream, cherries and pistachios. Using a wooden spoon, drizzle the caramel toffee over the top of the Eton Mess. And you are done!